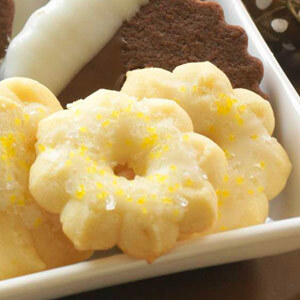 A lemon glaze tops off these delightful cookies. Serve with fresh fruit for a light dessert. In a large mixing bowl, beat butter with an electric mixer on medium speed for 30 seconds. Add granulated sugar and baking powder. Beat the cookie mixture until combined, scraping sides of bowl occasionally. Beat in egg, vanilla and lemon extract until combined. Beat in as much flour as you can. Stir in any remaining flour with a wood spoon. Do not chill the cookie dough. Pack unchilled dough into a cookie press. (Chilled dough won't work in the cookie press.) Force dough through the press onto ungreased cookie sheets. Bake in a 375 degree F oven for 8 to 10 minutes, or until edges of cookies are firm but not brown. Transfer to a wire rack and let cool. Drizzle or brush with Lemon Glaze; sprinkle with sugar, if you like. Dry for 30 minutes on waxed paper. Makes about 70 cookies. Bake and cool cookies completely. In an airtight container, arrange the unglazed cookies in a single layer; cover with a sheet of waxed paper. Repeat layers, leaving enough air space to close container easily. Freeze the cookies for up to 1 month. Thaw before drizzling or brushing with the lemon glaze and sprinkling with sugar. In a small bowl stir together powdered sugar, lemon peel, and lemon juice. Stir in enough milk to make icing drizzling consistency.